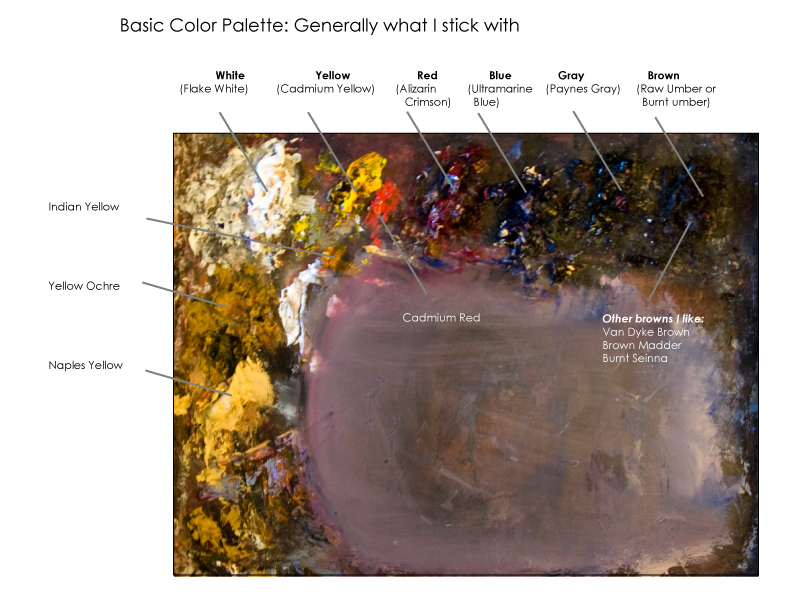 I am often asked what colors I use or what colors I put on my palette. There are a wide range of paint color choices and trying to decide which ones to use can get overwhelming quickly. I like to keep it simple. Today, I will show you a basic color palette and some variations of that palette. 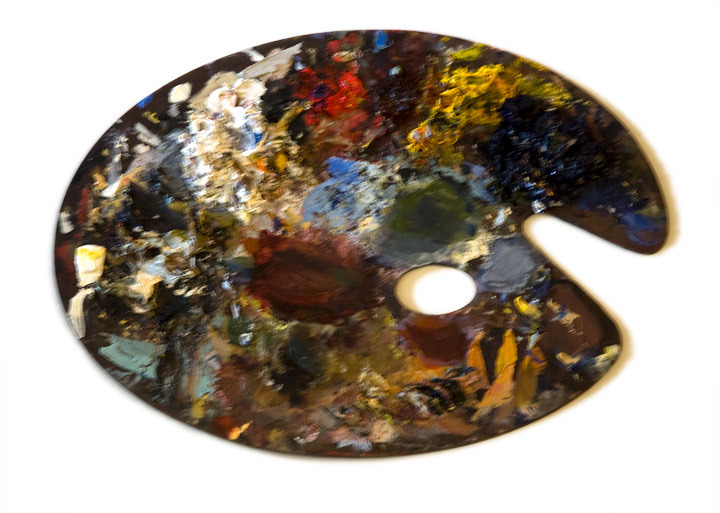 The color palettes one chooses to use and the choice of paints are a personal decision. You will come to the one you like after testing out new colors over time. I have learned many different basic color palettes; some using the earth tones, some sticking to the primary colors, and some getting highly complex. What you will want to do is play around with different color choices and see what works for you. I settled on the paints I like to use after trying many different approaches. I will vary it up from time to time, but what you see here is the color palette I generally like to work with. Here is an example of a basic color palette using the paints that are simular to the primary colors and white. With these four paints you can mix a large variety of colors, including black and grays. This next image is listing the specific paints I use. For white I use Flake White or, sometimes, Zinc White. For Yellow I will use Cadmium Yellow. For Red I like Alizarin Crimson. For Blue I like to use Ultramarine Blue. To allow for more flexibility and range in color choices I ask my students to use Cadmium Red instead of Alizarin Crimson. I add a couple of paints to this basic palette. Usually I will add a brown and a gray. I like Payne's Grey for a variety of reasons. One reason I like it is for making certain blues. Most often I will use a Burnt Umber or Raw Umber for brown. In general I look for brown paints that are more on the transparent side. One reason I might use these yellows is as shortcuts in mixing colors, for the most part I can get what I need out of the basic palette. However, I do like Indian Yellow for its the visual warmth it can add to a paint color. I like Alizarin Crimson, but as you can imagine, this color limits the possibilities of the reds I might want in a composition, so I will bring in Cadmium Red to help out from time to time. You can see I don't use it that much. These two brown paints are two of the ones that were recommended for me to try and I liked. So I will switch these in from time to time. I can be fairly loyal to the colors I use but I also like to move colors in and out of my color palette for a variety of reasons. Some I bring into my palette for specific tasks and some I add just for fun. You are welcome to try these color palette combos or introduce anything you might find interesting into your own color choices. Try mixing different colors from the basic palette above to see what kind of color range you can get from it. You might be surprised by the number of possibilities.